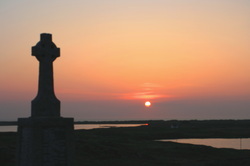 Almost on the machair (the fertile strip of land next to the western coast of the Island) our church was built in 1837and remodelled in 1955 when the porch, a Lady Chapel, and sacristy were added, and the interior of the church extended. During this renovation under the careful gaze of the famous architect Reginald Fairlie - the original plaster was removed revealing the ‘finest local stonemason work’ Fairlie had ever seen. That stonework can be seen in the picture below. Fairlie was also responsible for the National Library in Edinburgh and part of the University of Pittsburgh. .
Another memorable feature of our church are the two modern icons in the Lady Chapel of St Edith Stein and St Mary McKillop. These were commissioned from local artist and parishioner Michael Gilfedder. You can see a couple of videos of him introducing this work by clicking on the link to parish artist on our home page. Also check out more of his work showcased on his blog on our links page.